You like to enjoy German food and beer steins by swaying to live music and being part of typical Oktoberfest traditions? 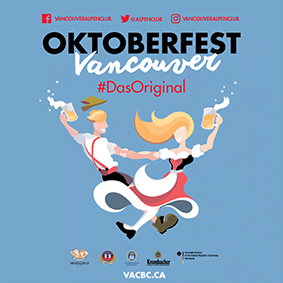 Then it’s time to unpack your Lederhosen and Dirndl as the Vancouver Alpen Club is pleased to announce its Oktoberfest #DASORIGINAL. Come and dance together with Vancouver’s very own Schuhplattler dance group the “Alpen Plattlers”. Sing along to original Oktoberfest music with “The Continentals” like you’d hear it at the “Wiesn” and be the best while participating in traditional games. Regular tickets $35 (plus taxes) include admission to the Oktoberfest #DASORIGINAL. VIP tickets $80 (plus taxes) include admission and access to a designated area that provides a delicious German buffet and a server who takes care of your drinks all night long. Tickets are limited, so be the first! Why are we “das Original”? Find out at one of the Vancouver Alpen Club’s Oktoberfest’s that are held on October 5, 6, 12, 13, 19 & 20.